Dana Robinson, a native of Boston, has performed on some of the most significant modern and historic organs in the United States, and has presented recitals, master classes, and lectures for the Boston and River Valley chapters of the American Guild of Organists, the Round Lake Historical Society, Boston's First Night festival, Methuen Memorial Music Hall, the Old West Organ Society, Baroque Artists of Champaign, and the National Convention of the Organ Historical Society. He has also appeared with The Boston Cècelia, Baroque Artists of Champaign, and with Dutch organist Paul Tegels, with whom he gives frequent duet recitals. His performances are frequently featured on the nationally syndicated radio program, Pipedreams. 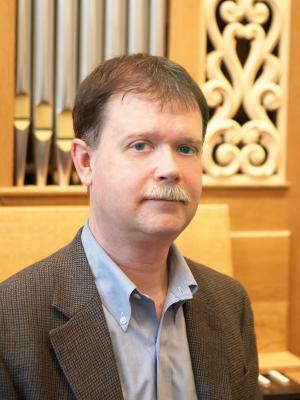 An active church musician, Professor Robinson has served as organist and choir master of Trinity Cathedral in Davenport, Iowa, and as organist and director of music for the Center of Faith and Life at Luther College. Professor Robinson is presently organist of Grace Lutheran Church in Champaign. He has held teaching appointments at Central College of Iowa, and Luther College. The recipient of numerous awards and honors, Professor Robinson won the Youth Concerts at Symphony Hall Concerto Competition, and First Prize in the Arthur Poister Competition. In 1988 he received the Frank Huntington Beebe Grant for study abroad. His principal teachers include George Faxon, Yuko Hayashi, Harald Vogel, and Delbert Disselhorst, and pianists Julius Chaloff and Kenneth Amada. My primary goal as a studio teacher is to enable students to teach themselves, and to develop habits for lifelong learning. To better equip students in this pursuit, I encourage development of three areas, which I believe to be interdependent: aural/instrumental skills, the ability to play what one hears, and to hear what one plays; technique, which I define as an integrated response to the music and to the instrument at hand; and musical understanding, both analytical and contextual, strengthened by acquaintance with the compositional process, knowledge of historical style, and understanding of performance practice and the history of the organ. In addition, I strive to help each student cultivate spiritual and physical well being, along with the ability to recognize and develop personal and musical strengths, and to recognize and address respective weaknesses. Continual exploration of the instrument's literature, as well as improvisation techniques, is also important. In the organ studio we strive to maintain a supportive and collegial atmosphere, where students are challenged to their full potential. Studio field trips to significant organs in the region enable students to hear examples of the best organ building being done today, and also provide the opportunity to get to know one another in a social context.